Martin S. Himeles Jr., managing partner of Zuckerman Spaeder’s Baltimore office, has more than 35 years of experience addressing complex legal problems through rigorous analysis, sound litigation judgment, and effective advocacy. Marty’s courtroom record includes trials of a broad range of civil and criminal matters, as a private practitioner representing corporations and individuals and as a federal prosecutor. Marty’s practice encompasses a diverse mix of litigation of commercial origin. He has represented businesses and individuals in criminal investigations and at trial and has won acquittals in federal criminal trials on behalf of clients charged with offenses such as fraudulently misrepresenting product test results to obtain government approval; wire and mail fraud; and federal campaign contribution offenses. He has led independent investigations for committees of the boards of directors of public companies that have faced grand jury investigations and other allegations of wrongdoing. He has represented health care providers in government and internal investigations of alleged fraud and abuse. And he has represented a range of business entities, professionals, and other individuals in complex civil litigation and has won cases as both plaintiff and defendant. Marty’s successes in appellate matters have given rise to often-cited decisions. For these accomplishments, Marty has been recognized with numerous honors. He is a fellow of the American College of Trial Lawyers; has been listed for 14 consecutive years in The Best Lawyers in America, in diverse practice areas including at present bet-the-company litigation, commercial litigation, white-collar criminal defense, and securities litigation; and is also listed in Chambers USA: America’s Leading Lawyers for Business as one of Maryland’s top 16 commercial litigators, and as a “Litigation Star” in the Benchmark Litigation guide. He has also been profiled in the Baltimore Business Journal’s “Who’s Who in Law,” among other publications. Before joining Zuckerman Spaeder in 1990, Marty was an Assistant U.S. Attorney in Baltimore, where he specialized in white collar matters. He headed the investigation of Dutch, German, and American businessmen which led to charges of selling a mustard gas precursor to Iraq, and he represented the government in coram nobis proceedings brought by former Maryland Gov. Marvin Mandel after the U.S. Supreme Court’s landmark decision in McNally v. United States. Marty also served as a law clerk for the Hon. Francis D. Murnaghan Jr., of the U.S. Court of Appeals for the Fourth Circuit. Marty is co-chair of the Health Care Fraud Substantive Committee of the American Bar Association (ABA) White Collar Crime Committee, and of the Equal Justice Council of Maryland Legal Aid, and serves on the Board of Director of the Francis D. Murnaghan Jr. Appellate Advocacy Fellowship. He is a past president of the Maryland Chapter of the Federal Bar Association and has spoken and written about the federal criminal justice system, about health care fraud and abuse, and about other legal matters. He serves on the Board of Governors of the Associated: Jewish Community Federation of Baltimore and on the Baltimore Jewish Council and has held leadership positions with the Baltimore Chapter of the American Jewish Committee and other organizations focused on Jewish concerns. Defended a manufacturer of a heat-resistant coating acquitted of charges of making false statements to the Nuclear Regulatory Commission (NRC). The client was alleged to have made false statements in order to obtain approval of a product used to protect safe shutdown cables in nuclear power plants. 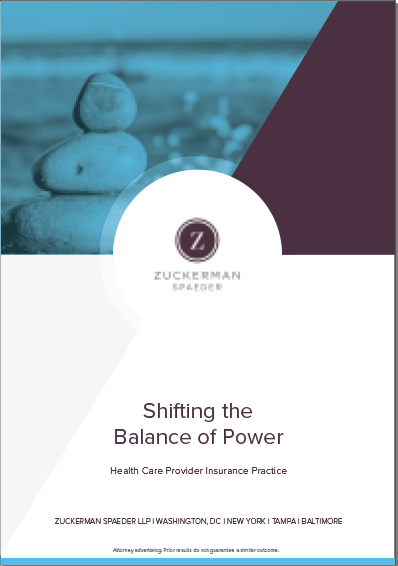 Prevailed at trial and on appeal in a complex declaratory judgment action permitting the termination of a long-term contract between a nationally recognized health system and a provider of essential services due to deficient performance. Represented a publicly traded national health care provider in a federal health care fraud investigation of national scope that concluded without government action. Successfully defended at trial a business executive charged with defrauding the United States of millions of dollars in connection with servicing large portfolios of mortgage-backed securities. Represented on appeal and remand a nationally prominent attorney in litigation seeking a share of a fee exceeding $100 million, obtaining reversal of a trial court decision dismissing the action. Represented a prominent executive of a widely known firm in the construction industry, obtaining an acquittal of federal campaign contribution charges arising from contributions made by employees to a federal congressional campaign, which the government contended were disguised corporate contributions and exceeded contribution limits. Represented the chief executive of a health care company in a qui tam case involving allegations that the company and a leading pharmaceutical manufacturer engaged in violations of the False Claims Act, the Anti-Kickback Act, and off-label promotion of the manufacturer’s products. Persuaded the Department of Justice not to intervene, and reached a resolution pursuant to which all claims were dismissed against our client. Represented a national health care provider in a federal health care fraud investigation concerning allegations of overbilling and beneficiary inducement. Represented a personal representative and beneficiary of a large estate in litigation arising from efforts by the decedent's widow to defeat a large charitable bequest. Achieved settlement supported by the charitable beneficiaries. Conducted an internal investigation into allegations of financial accounting fraud on behalf of the audit committee of a publicly traded health care corporation. Represented a business executive in litigation brought by a federal agency alleging nationwide consumer fraud and seeking millions of dollars in compensatory relief. Represented high-net-worth individuals and their families in disputes with their former trust and estates counsel arising from negligent drafting of wills and trust instruments that risked unnecessary estate tax liability, obtaining settlements that fully protected the clients against the possible imposition of the unnecessary estate taxes. Obtained summary judgment in complex litigation against a national cable television firm brought by a minority owner of a large cable television franchise seeking millions of dollars for breach of contract, fraud, and other torts. Represented a major Baltimore institution in defense of an action brought by a software provider asserting breach of contract, misappropriation of trade secrets, and other tort claims in connection with the client’s transition to other software. Prosecuted trade secret and related claims against a major government contractor, replacing predecessor counsel after the complaint was dismissed, defeating a motion to dismiss an amended complaint, and developing critical evidence in discovery that led to a favorable settlement. Represented a multinational technology company in a copyright infringement action against a competitor for copying source code in copyrighted software, achieving a favorable settlement with both permanent injunctive relief and the payment of damages. Represented a regional construction firm and its owner in a five-year federal grand jury investigation of minority business enterprise fraud, persuading federal prosecutors not to pursue criminal charges or seek civil remedies against the firm or any of its employees. Conducted an internal investigation into alleged criminal antitrust violations for a special committee of the board of a publicly traded company. Represented the former CEO of a leading regional health care provider in a federal health care fraud investigation.